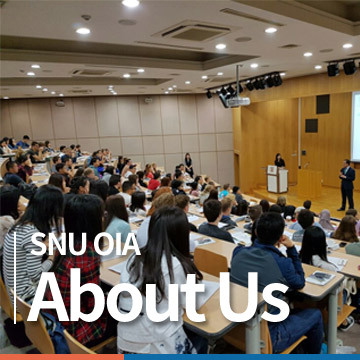 SNU ISI presents a unique opportunity for students to experience academic life at Seoul National University, Korea's most prestigious university and one of the leading universities in the world. SNU ISI's intensive six-week summer program, taught by distinguished SNU and visiting faculty members, offers students a chance to learn in depth about Korea and East Asia, as well as a range of topics from the disciplines of Economics and Business Management to History, Politics, Sociology, and Arts. SNU ISI also provides courses on Korean language and traditional arts for students wishing to acquire or advance their Korean language abilities while immersing Korean contemporary and traditional culture. The SNU ISI team is committed to create a "home away from home" at SNU for students participating in the SNU ISI program. The team provides one-stop service, answering to any inquiries and assisting students at each stage, including application, registration, records, tuition payment, etc. During the program, the team is supported by more than fifty assistant staffs, most of whom have previous experience of the SNU ISI program, to work with the team closely as resident advisers and teaching assistants. Any inquiries about the SNU ISI program can be made by email, by phone (during office hours), or by visiting the SNU ISI Office in person.